Sikkim Manipal University is one of the well-established universities, in the country, and was established in the year 1991. The university was set up through a unique partnership between the Sikkim Government and Manipal Pai Education. The 2-year Distance MBA program offered by SMU-DE ensures that the educational needs of students are fulfilled without attending regular classes. The program structured in a way with updated syllabi and industry equipped with practical scenarios to make the students market apt. Sikkim Manipal University Distance Education (SMU-DE), the distance education branch of the university was established in 2001 to cater the higher education needs of the students and working professionals. The institute since its inception has enrolled over 5,00,000 students. The strength for 2016-17 was 10,185 students. The admission process into the Distance MBA program offered by SMU-DE is pretty simple. Kindly follow the below-mentioned steps for the application and admission process. 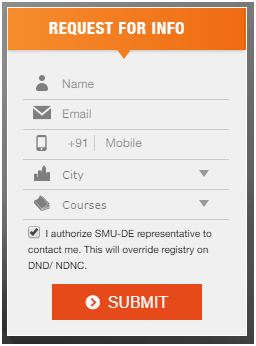 STEP:1- Visit the official site of Sikkim Manipal Distance Education and fill out the request form (shown below) and click on “submit” button. STEP:2- Once the details are filled out, an SMU counselor will contact you and ask basic details for a better understanding. STEP:3- Once done, the application form will be emailed to you. Fill out the application form with personal, educational details. STEP:4- Attach the necessary documents, pay the application fee and submit the form. STEP:5- The institute will scrutinize your application and inform you about the status. The fee for the course after admission to the course may be paid online via Credit/Debit card. Sikkim Manipal University charges Rs 20, 000/- per semester for the Distance MBA course. This is inclusive of the cost of Examination fee of Rs 5,000. The university has a tie-up with Bajaj Finserv for providing no-cost EMI’s to its students. Kindly contact your counselor for more details. The admission into the MBA course is solely dependent on your graduation degree. The candidate should have at least 3 graduation degree from a recognized university. The university website does not state any minimum marks criteria. It is to be noted that earlier the admission was based on SMAT (SMU Management Aptitude Test) which is no longer functional. The university through its MBA course strives to provide its students with the necessary skills in management and enhance the student’s analytical ability. The university offers 4 specializations for the Distance MBA course. Below mentioned is the criterion along with subjects/topics which will be covered in the course of study. The university is approved by the UGC, and the Distance Education Council (DEC) to conduct its programs. The university is also an ISO 9001:2008 institution. Although the university is approved to start courses without prior approval by the AICTE, it has provided that the institution may conduct its inspection and render advice, in the near future. It is also a member of the International Council for Open & Distance Education (ICDE). The University is well equipped to provide the students with job prospects and holds many Placements – drives in its institutions (over 600 have already been held). Currently, over 9000 students have been placed through job opportunities and SMU Alumni network. The Institute also organizes job fares from time to time in various cities. Top recruitment companies are part of these job fares. As per the Supreme Court Judgment dated 26th June 2015, all SMU Study Centres have been closed down. Therefore, the institute does not have any centre located in any state of the country. The institute will not be responsible for any communication between the student and any “unofficial franchise/study centre”. If found, kindly report to the university.